PRLog (Press Release) – Aug 12, 2010 – We grow up hearing that ‘life is not a bed of roses’ and gradually we start realizing it once we face the real world. Every now and then we confront with situations which are difficult to deal with and hard to escape. Like any one else I used to think that my problems are unique and have no solutions until I attended a lecture of Sri Madhu Pandit Dasa on Bhagavad-Gita. The topic -‘Facing life’s challenges in Bhagavat-gita way’ caught my attention and prompted me to attend the session. I attended the session expecting a very quick solution of leading a successful life. 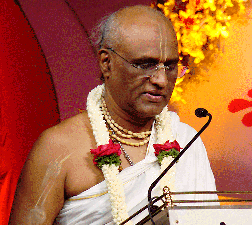 The lecture started and Madhu Pandit Dasa clearly pointed out what Bhagavad-Gita is not. He said Bhagavad-gita does not give us any formula to meet life’s challenges. It does not tell us about different techniques of dealing with life, rather it goes to the root of our existence and helps us identify the worthy challenges of life and tells us what life is meant for. He narrated in a lucid way how Arjuna was guided by Sri Krishna in the battle field of Kurukshetra when he had to fight against his close acquaintances. How Krishna narrated Arjuna about the life itself. He said most of the time we fail to understand the value of our life and spend most of our time worrying about things which we have to leave behind and go. It was a one hour session and I was greatly inspired by the way Madhu Pandit Dasa related Bhagavad-gita with the challenges we face in life and how can we prioritize life’s challenges and deal with it. Such sessions are of great help to the young generation today who are in to the rat race competing every moment to achieve their goals…where the chances of disappointment and frustration are on the peak. It does not give you a formula but definitely helps you to deal with it.